Scientists working with NASA’s New Horizons spacecraft have observed Pluto’s atmosphere as far as 1,000 miles (1,600 kilometers) above the surface of the planet, demonstrating that Pluto’s nitrogen-rich atmosphere is quite extended. This is the first observation of Pluto’s atmosphere at altitudes higher than 170 miles above the planet’s surface (270 kilometers). The new information was gathered by New Horizon’s Alice imaging spectrograph during a carefully designed alignment of the sun, Pluto, and the spacecraft starting about an hour after the craft’s closest approach to the planet on July 14. During the event known as a solar occultation, New Horizons passed through Pluto’s shadow while the sun backlit Pluto’s atmosphere. This figure shows the locations of the sunset and sunrise solar occultations observed by the Alice instrument on the New Horizons spacecraft. The sunset occultation occurred just south of the “heart” region of Pluto, from a range of 30,120 miles (48,200 km), while the sunrise occurred just north of the "whale tail", from a range of 35,650 miles (57,000 km). 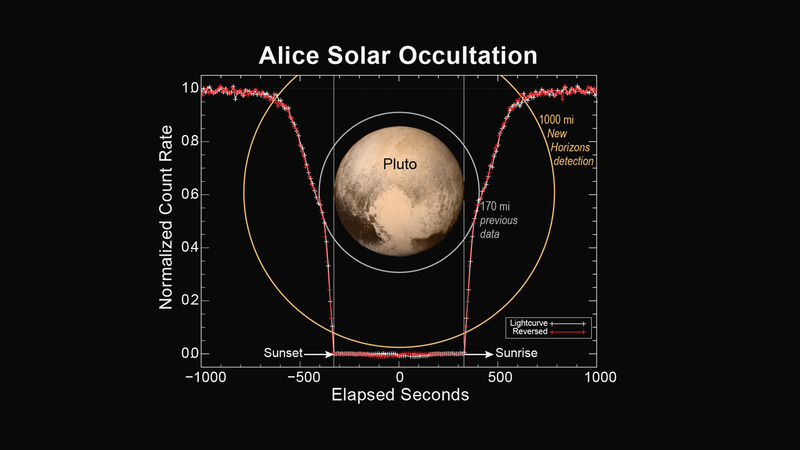 This animation shows how the count rate observed by New Horizons’ Alice instrument decreases as Pluto’s atmosphere passes in front of the sun. The decreasing count rate is due to the ultraviolet sunlight having to pass through progressively larger amounts of the atmosphere as the spacecraft line of sight gets closer to Pluto. 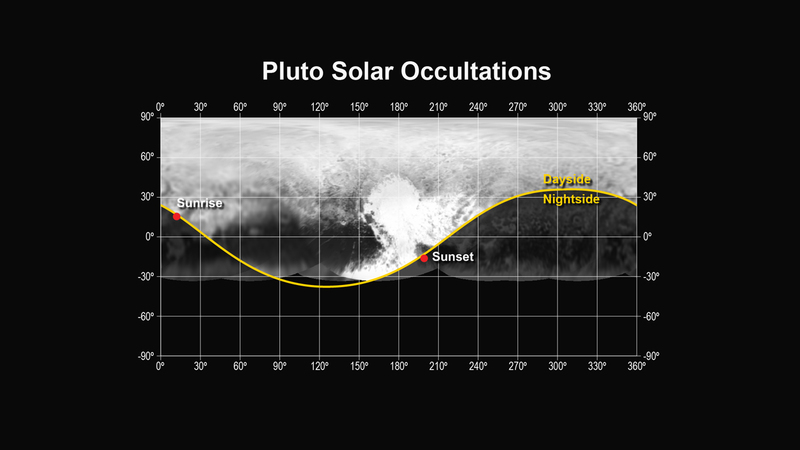 The observed count rates are compared with predictions based on two plausible models of Pluto’s atmosphere: a “turbulent” case, where the expected count rate is relatively large, due to small amounts of sunlight-absorbing hydrocarbons in the lower atmosphere, and a “stagnant” case, where much larger hydrocarbon abundances are predicted. The preliminary count rate data from Alice are matched by neither model, but are closer to the stagnant case.